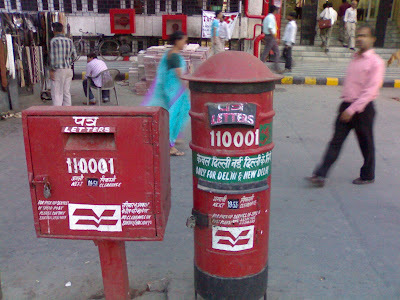 Even as the world passes-by quickly, the symbols of Indian postal services - Letter boxes, standstill waiting for that elusive letter that might be fed to them in this day and age of E-mail. When I had started with the idea of the Delhi Photo Diary, I had just thought of it as a collection of peculiar photos that define Delhi for me. However, with each passing day, it is turning out to be quite a revelation of the progress that the city has made within my lifetime of 24 years. The blog is now a chronilce of Delhi that is slowly but surely changing from how I like to remember it. see them only in the post offices and the only boxes on the street one sees now are the drop boxes to drop your cheques for various utilities! Ah yes blogging makes you see the things you never saw before.